Hello there, I have the pleasure of guest designing for The Alley Way Stamps today. They sent me the All Washed Up stamp set to have a play with, and I couldn't be more delighted! It is such a cute set! For my card, I started off with a piece of TH Watercolor cardstock. I then ink smooshed various colours of TH Distress Ink on to it, heat setting each layer as I went. The colours I used were Broken China, Peacock Feathers, Mermaid Lagoon and Chipped Sapphire. Once these layers were dry I took a fan paintbrush and added water to this. I then flicked the paintbrush to add some water droplets to the panel. 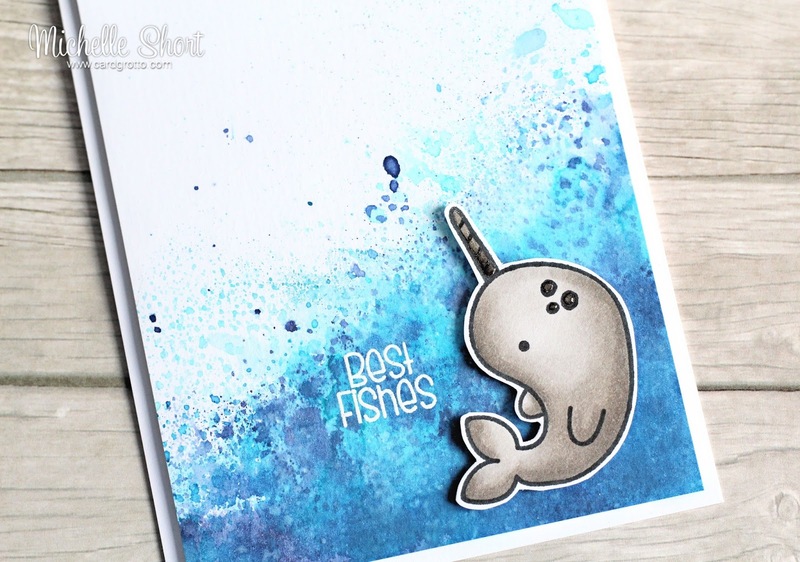 On a separate piece of cardstock, I stamped the cute narwhal from the set, using Memento Tuxedo Black ink. He was then coloured using Copic Markers and fussy cut out. The sentiment was stamped on to the panel with Versmark ink and heat set with WOW! Bright White embossing powder. 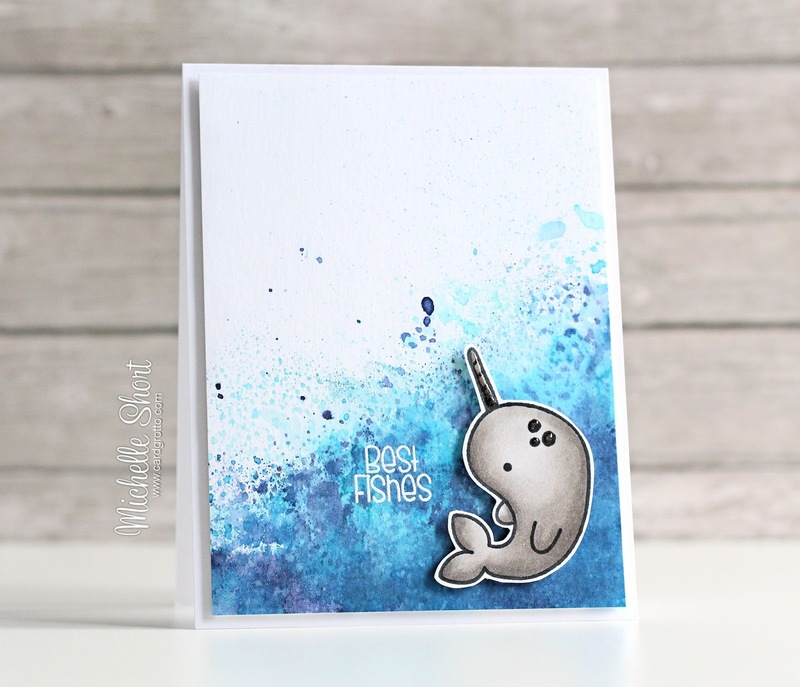 The panel was adhered to an A2 white card base with lots of foam tape and the narwhal added on top. To finish off, I added a little clear Wink of Stella and some Glossy Accents to the narwhal. COPIC MARKERS: W1, W2, W3, W4, W5, W7, W8. Please pop over to The Alley Way Stamps Blog for more inspiration using this set. Please check out their You Tube Channel as well. Thank you so much for visiting me today. Have a lovely day! Great video Michelle as always, awesome techniques and a super cute and cool card. Adorable card, Michelle, and a wonderful video! Great technique on adding the watercolor using the plastic. Duh moment for me and will use it from here on out. Darling card. Just so adorable!!! The Inking Smooshing Technique looks like so much! I now know that I am definitely going to have to give this a try!! Thanks so much for the fabulous video Michelle, I am still a bit afraid of watercoloring on my cards but I love the way you show how to make a fun background. Stunning and very cute card! A fabulous video, Michelle, showcasing a technique that I'm trying desperately to master. My smooshing is so pathetic! I'll be replaying your instructions several times...bound and determined to 'get it'. Your narwhal: darling!